Capping over 50 years of touring and recording, George Clinton is set to embark on his final tour with the legendary Parliament Funkadelic before he retires. The group will hit the road in North America with the “One Nation Under a Groove Tour,” making a stop at H-E-B Center at Cedar Park on August 22. Joining P-Funk to send this icon of American pop culture off with a BANG are Dumpstaphunk, Fishbone, and Miss Velvet & The Blue Wolf all of whom are taking time out of their own busy schedules to hit the road with the Grammy-winning, once-rainbow-dreaded pioneer of Funk, Hip Hop, and Rock & Roll. 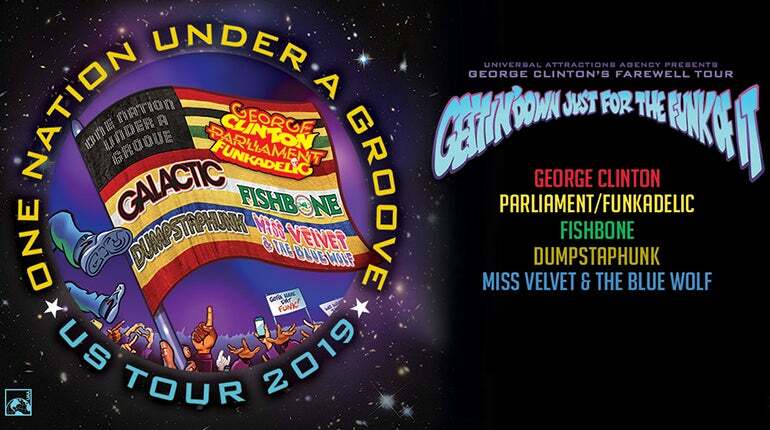 The "One Nation Under a Groove Tour" is the latest blockbuster package tour created by Universal Attractions Agency, George and P-Funk’s booking agency. The tour was conceived around the anniversary of the iconic Album and single of the same title. "We had been kicking this idea around for a long time" recalls Nick Szatmari, George's Agent at UAA. "It just felt organic and authentic, especially with the current social climate and the powers that be trying to divide everyone; it has always been a call for unity and togetherness through music. When George announced his retirement it just all clicked. It’s surreal how it all came together, and we are very fortunate to have the support of Dumpstaphunk, Fishbone, and Miss Velvet & The Blue Wolf on this historic tour". UAA and its co-owners, Jeff Epstein and Jeff Allen, are gearing up to celebrate the 75th anniversary of the company's founding in 1945 with "One Nation Under a Groove" as the flagship tour for this year among many shows they are rolling out for the 2019-2020 season "We are excited and honored to be sending one of the most iconic touring artists in history into his well deserved retirement with a bang, and quite a bang this will be. It is a fitting culmination of our years of work together" says Jeff Epstein. Billboard summed up the historic nature of this moment perfectly in their coverage of the retirement announce: "If you want to watch the original master of funk do his thing, you’ve got one more year. Parliament/Funkadelic frontman/producer George Clinton is set to retire from touring in 2019."